A man armed with a sword was killed and two police officers injured by gunfire at a Church of Scientology in California, authorities say. Police gave few details but said the man entered the Los Angeles church with a "very large sword" on Wednesday. Detectives were still trying to establish whether the suspect - who arrived at the church in a white Bentley - had a gun, Inglewood Police Lt Oscar Mejia told reporters on Wednesday. Two police investigations and a district attorney's investigation are talking place into the incident. The Church of Scientology's Inglewood branch opened in November 2011, according its website. It is based about 16 km (10 miles) south of the church's main Celebrity Centre in LA, which attracts famous actors, politicians, musicians and athletes. What is the Church of Scientology? Scientology was founded by American science fiction author L Ron Hubbard in 1952. He said human beings contained the souls of Thetans - immortal creatures responsible for making the Universe - but also said the world had been invaded by dark forces and individuals could be cleansed and enlightened only through intense therapy called Dianetics. 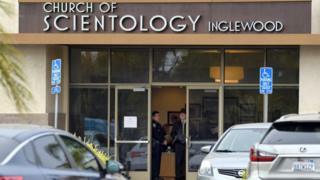 It is a costly process and the Scientologists expect their adherents to donate considerable sums. In the US, where Scientology has attracted a number of Hollywood celebrities such as Tom Cruise and John Travolta, it enjoys the full rights of a recognised religion.